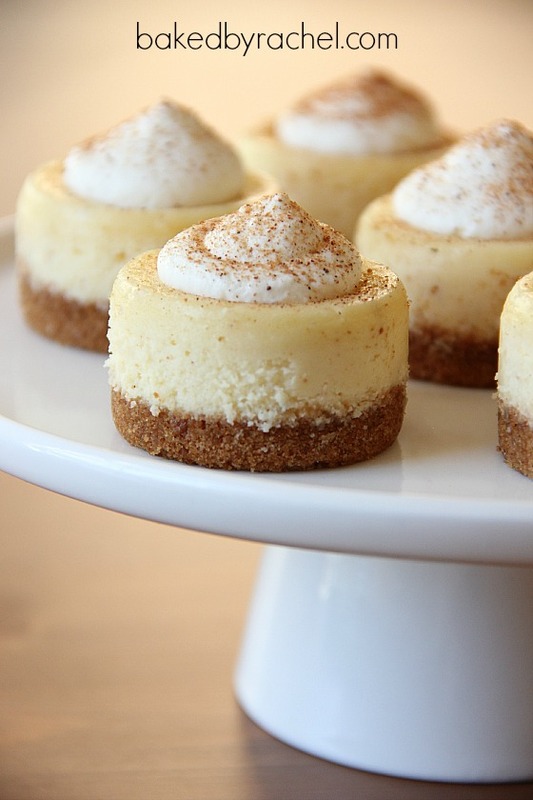 Easy and luscious mini eggnog cheesecakes, flavored for the season. Served in individual portions making this a perfect party dessert. Do you watch Last Resort? It’s one of those new shows we decided to give a chance and we’re pretty much hooked. Only this week, for the first time, I kept expecting Scott Speedman’s character to morph into a creepy hyrbid werewolf creature or for Felicity to come strolling up on the beach. I guess the good thing is that he plays different roles, unlike so many other actors that basically play the same role in every show or movie they’re ever in. Nice range but still strange. I think I like him best in Last Resort though. Before we get carried away here… these cheesecakes should absolutely be on your holiday party menu. Mini eggnog cheesecakes, topped off with homemade sweetened whipped cream, a dusting of nutmeg and served on top of a drizzle of tart cranberry puree. It’s a simple but luscious treat that you won’t want to share. I think mini desserts are my new favorite thing. Add them to the same category as cupcakes and cookies. Betcha can’t eat just one. I do love a full pie but there’s just something great about individual servings. No slicing required. You can prep the dessert table and have your guests serve themselves. You shouldn’t be slaving away at your own party anyway. 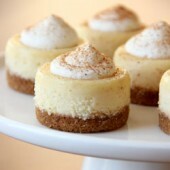 Sit back and enjoy with a glass of spiked eggnog or cider, and of course one of these mini eggnog cheesecakes. Tis the season. 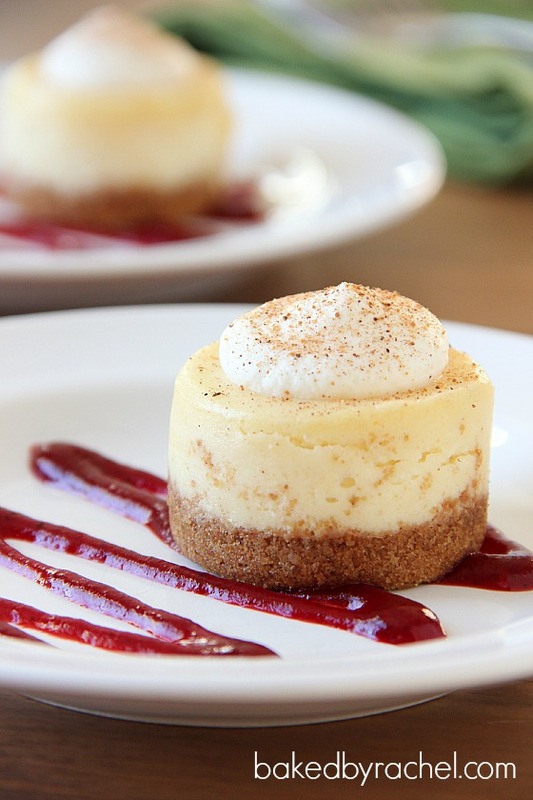 Easy and luscious mini cheesecakes, flavored for the season. Served in individual portions making this a perfect party dessert. Preheat oven to 350°F. Lightly grease the cavities of a 12 cup mini cheesecake pan . In a food processor or large bowl, combine crust ingredients. Divide evenly between prepared cheesecake cavities. Firmly press down to create and even crust. Bake for 5 minutes. Meanwhile in a large bowl or stand mixer, beat together sugar and cream cheese. Add eggnog, flour, vanilla, nutmeg and salt. Mix until well blended. Add egg, mixing only until just combined. Fill cavities 3/4 full. Bake for 15-18 minutes or until centers are only slightly jiggly. Remove to a wire rack to cool for 1 hour. Transfer to refrigerator to chill 4 hours or overnight. Serve with fresh sweetened cranberry puree, sweetened whipped cream and a dusting of nutmeg. Store leftovers in the refrigerator.